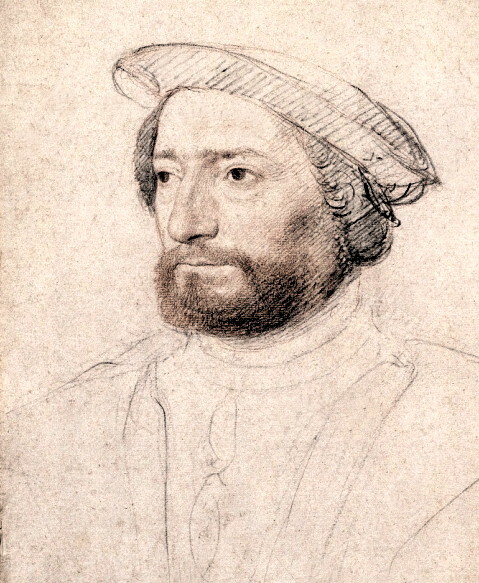 LA ROCQUE DE ROBERVAL, JEAN-FRANÇOIS DE, lieutenant-general in Canada; b. c. 1500, probably at Carcassonne, of which his father was the governor; d. 1560 in Paris. He was the son of Bernard de La Roque dit Couillaud, the seigneur of Châtelrein, and of Isabeau de Poitiers. His maternal grandmother was Alix de Popincourt, the dame de Roberval in Picardy. The La Roques belonged to a very old noble family in the south of France. Bernard de La Roque was a gentleman of the king’s household, an ambassador, and an officer of the Comte d’Armagnac; he was involved in the trial of the Maréchal de Gié. La Rocque de Roberval lived at the court in the circle of Prince François d’Angoulème who, on becoming king of France, continued to be his protector. This fact saved him in 1535. As a Protestant convert, he was outlawed, along with other Protestants, including Clément Marot. He soon returned to France and again lived at the court. A portrait of La Rocque de Roberval by Clouet is among the 310 portraits of members of the French court in the collection at the Château de Chantilly. Roberval had, however, jeopardized his fortune. He borrowed from his cousins: the La Roque de Blaizins in Languedoc, the La Roques in Armagnac, and the Popincourts in Picardy. It was then that he seems to have conceived the idea of recouping his fortune in Canada. In 1540 he had completely recovered the favour of François I. Had he by then returned to the Catholic faith? François I appointed him as his “lieutenant-general in the country of Canada,” where he was charged with “spreading the holy Catholic faith.” The terms of his commission were clear-cut: his mission was to found a colony where he was to construct churches and fortified towns. He received a subsidy of 45,000 livres, and he fitted out three ships, the Valentine, the Anne, and the Lèchefraye. Some gentlemen were to accompany him, and the king gave him authority to take criminals from the prisons in order to begin his colony. “On 15 January 1541,” says the historian Gustave Lanctot, “François Ier signed the commission that marked the beginning of French colonization.” Jacques Cartier was to serve as Roberval’s guide. But Cartier left in May 1541 with his ships, while Roberval did not leave until the following year. They met at St. John’s (Newfoundland) and Cartier returned to France despite Roberval’s orders. Roberval had had difficulties in organizing his expedition; he had been obliged to sell some properties and to borrow money. At this time he was associated with Bidoux de Lartigue and was sailing the seas as a pirate. The English ambassador complained to François I about the seizure by Roberval of English ships; the king pretended to be angry with La Rocque. The latter’s preparations for the voyage had made the Spaniards uneasy and one of Charles V’s spies informed him that the destination of the voyage was Canada. The three ships, piloted by Jean Fonteneau, sailed from La Rochelle. The crossing lasted from 16 April to 8 June, on which date Roberval met Cartier at Newfoundland. The expedition navigated the Gulf of St. Lawrence and the river without incident except for the romantic adventure of Roberval’s “relative,” the young lady Marguerite de La Roque, who was left on an island with her lover. Roberval established his colony at Charlesbourg-Royal on Cap Rouge, where Cartier had already built a fort. Like the courtier he was, La Rocque de Roberval gave his Canadian colony the name France-Roy and called the river France-Prime in honour of François I. A fort was erected, and André Thevet wrote in his Cosmographie that they built “a fortified house,” and that another “was begun on the bank of a river called in the language of the barbarians the land of Sinagua” The “land of Sinagua” was probably the Saguenay. Roberval undertook some exploring; he went up the St. Lawrence and tried to get through the Lachine rapids. He attempted to explore the Saguenay, where he thought he would find precious stones and gold. His boats, manned by 70 men and under the command of Lespinay, La Brosse, Longueval, and Frotté, returned without having found either the kingdom of Saguenay or the precious stones. One of the craft had gone down with Noirefontaine and Le Vasseur aboard. But the severest test was the winter spent in the forts. The little colony was sorely tried by cold, famine, and sickness. The situation became tragic. Apparently Roberval had to suppress uprisings. A passage in Thevet shows him behaving with thoroughly Calvinistic harshness: “Capt. Roberval was very cruel in dealing with his men, forcing them to work; otherwise they were deprived of food and drink. If anyone failed in his duty, Roberval had him punished. One day he had six of them hanged and some he ordered to be banished to an island, in leg-irons, because they had been caught in petty thefts involving not more than five sous. Others, both men and women, were flogged for the same offence.” If Roberval displayed such terrible severity, it was because his colony was composed principally of habitual criminals. He did, however, exercise his right of pardon in favour of a man named Aussillon de Sauveterre, who, it is true, had accompanied Roberval of his own volition. When he killed a refractory sailor, Sauveterre received a letter of remission. This document, dated in Canada on 9 Sept. 1542 and bearing the handwritten signature “J. 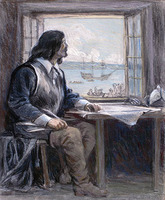 F. de La Rocque,” is the first and oldest official Canadian document. Roberval appears at an early date to have had doubts about the success of his enterprise, and he sent a ship to France bearing Sauveterre and Guignecourt to seek the king’s help. He then embarked with his whole company on the vessels sent by François I. His colony had lasted only a few months. Certain historians have said that Jacques Cartier was in charge of this rescue expedition, but this fourth voyage to Canada by Cartier is extremely doubtful. In the king’s order of 26 Jan. 1543 to Aussillon de Sauveterre, who was sent to Roberval’s assistance, there is no mention of Cartier. Charlevoix* claimed that Roberval made a second voyage to America with “his brother Pierre de La Roque” and that they perished in a shipwreck in 1549. But Roberval certainly did not perish in 1549, because in 1554 he carried on a lawsuit against Jean de Boutillac. And his brother, whose name was not Pierre but Jean de La Roque, did not sail the seas, for he was a monk and prior of his order in Normandy. Roberval’s attempt at settlement was disastrous for himself, for Canada, and even for Jacques Cartier. The “precious stones” gathered on Canadian soil and the “gold” were neither precious stones nor gold. “When the chemists tested them,” says Gustave Lanctot, “the gold was found to be iron pyrites, the diamonds were mica. With the evidence of the crucible, the hopes of the kingdom had crumbled in cataclysmic fashion. A dream that disappoints us is never forgiven. Of Cartier’s great achievement, of his three expeditions there remained in France only the proverb, ‘as false as Canadian diamonds.’ Cartier ceased to be the experienced captain, the great explorer on whom were fixed the eyes of a whole nation.” And Canada no longer interested anyone in France for 50 years, until the coming of Champlain. There were several reasons for this failure. First among these was the character and position of Roberval. Not at all a sailor, but a professional soldier, he was above all a courtier, as proven by his presence among the troops of the Maréchal de La Marck and the inclusion of his portrait among the likenesses of the members of the French court. What was he seeking in America? Probably, like the conquistadores, he wanted to make his fortune. But his crotchety temper and his roughness of manner had alienated his companions in adventure. Furthermore, this group was very unevenly constituted: gentlemen, courtiers like himself, even society women, and above all a pack of criminals taken from the prisons. He was commissioned to found a Roman Catholic colony and he was himself a Protestant. He is thought to have been an engineer because he later had himself entrusted with the operation of the mines of France, but he had no need to be an engineer for that. Lastly, his voyage had been badly prepared. His faulty administration of his own assets shows moreover that he possessed none of the qualities essential for a great colonizer. Ruined by his Canadian colony, he struggled with great difficulties. In 1544 he appeared before the commission established to examine his accounts and those of Jacques Cartier and the latter won his case. In 1555 Roberval’s holdings were mortgaged and his château threatened with seizure. The letters patent that king Henri II had given him for the operation of the mines of France do not seem to have made him rich. 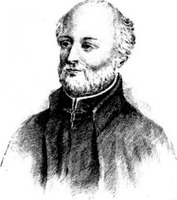 By his loyalty to his Protestant faith, Jean-François La Rocque de Roberval became one of the first victims of the Wars of Religion. Coming out of a Calvinist meeting one night in 1560, he was attacked, along with his fellow Protestants, and was killed at the corner of the Cimetière des Innocents in Paris. The remnants of his fortune passed into the hands of his creditors; his château at Roberval was bought back by his nephew Louis de Madaillan, the son of Charlotte de La Roque. In the 18th century this château belonged to the Prince de Soubise, and in 1817 became the property of M. Davène de Fontaine. Completely transformed, the château no longer resembles in any way what it was in the time of Jean-François de La Rocque. His personal papers are, however, preserved there. Published by H. P. Biggar, these documents have revealed part of the life of this man who, in the 16th century, tried to colonize Canada. What is curious in the case of Roberval is that his personality and his adventures in Canada have left their traces in 16th-century, French literature. 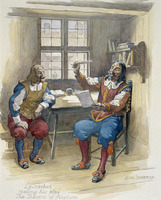 Rabelais speaks of him, calling him Robert Valbringue; the Queen of Navarre recounts the romantic story of his relative Marguerite de La Roque; André Thevet gives us valuable information about him and about his colony; the court poets Clément Marot and Michel d’Amboise dedicated works to him. Lastly, a Protestant-inspired Latin poem, Robervalensis Epitaphium is included in an anonymous collection of poetry in the Bibliothèque Nationale in Paris. This work recalls Roberval’s voyage to Canada and his assassination in 1560. It has been possible to identify some of Roberval’s companions, among whom, however, one must distinguish between those who went to Canada as volunteers and the criminals taken from the prisons and forced to set sail. Among the gentlemen who made the voyage, one can identify with certainty Paul d’Aussillon de Sauveterre, thanks to a document in which his first name, his family name, and the name of his land are inscribed: the letter of remission of 9 Sept. 1542. Aussillon de Sauveterre was a mariner and was in command of the Anne, one of Roberval’s three vessels. It was he whom his chief would later send with Guignecourt to seek the king’s aid. He belonged to the Aussillon family, who were seigneurs of Sauveterre and La Cabarède, in Languedoc in the bishopric of Castres. Longueval likewise can be identified: Robert de Longueval, the seigneur of Thenelle, was related to Roberval, for he had married the daughter of Catherine de La Roque and Robert de Hangard. He was a gentleman of the king’s bedchamber. Longueval took part in the Saguenay expedition in which Noirefontaine and Le Vasseur were drowned. The other companions of Roberval cannot be positively identified. Nevertheless one can well believe that Nicolas de Lespinay is the same person as the Nicolas de Lespinay who was a son of Hutin de Lespinay, seigneur of La Neuville; Nicolas did homage for this seigneury to the Duc d’Orléans, Comte de Clermont in Beauvaisis, on 28 April 1545. Nicolas de Lespinay married Marie de Caulincourt in 1550. Noirefontaine might be one of the Noirefontaines who were seigneurs of Le Buisson in Champagne. Guignecourt (Guignicourt) perhaps belongs to the family of Guignicourt, seigneur of La Motte, near Laon. Beauvaisis, Champagne, and the town of Laon are all near the Château de Roberval. As for Jean de La Salle, could he be Jean de Lartigue, seigneur of La Salle, who was a gentleman of Queen Marguerite of Navarre? The Lartiques were a family from Gascony, a region where Jean-François de La Rocque had lands and family connections. H. P. Biggar identified some 15 of the criminals taken from prisons by Roberval under the authority of the royal letters of 1541. M. Robert Marichal has added seven names to the list. These individuals of deplorable reputation all died in Canada or returned to France. Among them the only one who deserves mention is Pierre Ronsard, because of the role that he was able to play during the expedition. For, if Blarye dit Titailt, a murderer; Jacques Le Gall, a thief; Louis de Villaine, an assassin; Le Page dit Chaudron, a cook in the service of the Duchesse de Nevers and an assassin, had no influence on the fate of Roberval’s colony, Pierre Ronsard seems to have had a job on the expedition which was, to say the least, unusual. This Pierre Ronsard, born about 1480, was approximately 60 years old when Roberval obtained his release from prison. The master of the mint at Bourges, he had been condemned for falsification and for “altering coins.” But he was a technician, and Roberval needed him, in view of the fact, says the royal letter of 31 March 1541 “that the said Ronsard might render great service to the said La Roque on the voyage to be made by him to the territories across the seas.” This indicates that Roberval’s objective in going to Canada was above all to discover precious metals. It may have been Ronsard who “assayed” the stones gathered in the Saguenay district and who declared them to be gold. And thus, writes R. Marichal, Ronsard might be the person really responsible for the tremendous disillusionment which was to put a halt to colonization in Canada for half a century. AN, E, 191, 193; N.X. 2 A91; Z1b, 32. Archives du Vatican, 57. Archivo de Indias (Sevilla), 2. Archivo General en Simancas, Estado, 53. BN, MS Fr. 15452-53 (“Le grand insulaire et pilotage d’André Thevet, Angoumoisin, cosmographe du Roy, dans lequel sont contenus plusieurs plants d’isles habitées et deshabitées et description d’icelles”); 20291; 29007 (P.O. 2523); 30612 (Carré d’Hozier 383); 31096 (Cabinet d’Hozier 215). Biggar, Documents relating to Cartier and Roberval. Charlevoix, Histoire. Hakluyt, Principal navigations (1903–5), VIII, 283–89 (the only English account of Roberval’s 1542 voyage, first published in 1600). Marguerite de Navarre, L’Heptameron des nouvelles (Paris, 1559). Mémoires des commissaires, I, 149; and Memorials of the English and French commissaries, I, 205. Emmanuel Cathelineau, “D’une épitaphe sur Roberval,” NF, VI (1931), 302–12. Hoffman, Cabot to Cartier. Lanctot, Histoire du Canada, I, 98, 99, 101–7, 116, 413; Jacques Cartier devant l’histoire (Montréal, 1947). A.-J.-M. Lefranc, Les navigations de Pantagruel (Paris, 1905). R. Marichal, “Les compagnons de Roberval,” Humanisme et Renaissance, I (1934), 51-122. Robert La Roque de Roquebrune, “Roberval, sa – généalogie, son pére et le procès du maréchal de Gié, le portrait de Chantilly,” RHAF, IX (1955–56), 157–75. R. La Roque de Roquebrune, “LA ROCQUE DE ROBERVAL, JEAN-FRANÇOIS DE,” in Dictionary of Canadian Biography, vol. 1, University of Toronto/Université Laval, 2003–, accessed April 26, 2019, http://www.biographi.ca/en/bio/la_rocque_de_roberval_jean_francois_de_1E.html.